I can never find the time to updated my post here, so go to our Face Book page for the latest updates on what is going on at Simpsons Family Farm. Due to the extreme weather conditions this spring and the hot weather we are having now, we will not have any blackberriesthis year. Hopefully next year will be better for them. The garden is also suffering from the heat. We will be taking our produce to the Farmers Markets in Cabool, Ava and Mtn. Grove. Hopefully the tomatoes will take off and we will have them at the farm, but for now it is just at the Farmers Markets. The blackberries are starting to ripen. Give us a call to see when we will be picking. 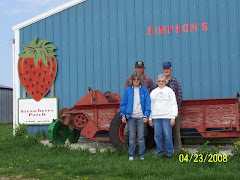 Simpson's farm is a family owned and operated fruit and vegetable farm located at Mountain Grove, Missouri. Simpson's offer a wide variety of fruits and vegetables, as well as, hanging baskets, honey, mums and bedding plants.